As more companies move to the cloud, they need a directory service that offers user management control across multiple devices and applications, whether on-premise or not. Since its advent in 2006, Amazon Web Services (AWS) has been leveraged by many organizations who need IT infrastructure for cloud computing. 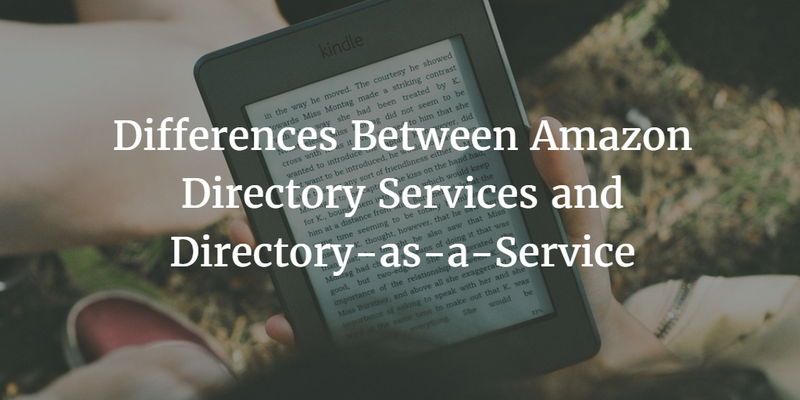 Nowadays, Amazon has extended its services by offering a Directory Service (DS) to its customers, based on the open-source solution Samba, that connects AWS servers to Microsoft Active Directory (AD) and extends user managed in AD to the Amazon EC2 infrastructure. Before Amazon’s Directory Service, system admins had to manually manage their users on AWS cloud servers. Some used Chef or Puppet, while others deployed Active Directory through an AMI in VP with two AD instances. All of which is a challenge to manage, due to the upheaval of manual work needed, including setup, configuration, and on-going management. Without Microsoft Active Directory, IT teams had to also install “Simple AD,” a directory database using the SAMBA protocol. In short, the onus was (and still is) on the systems admins to manually configure AWS with an Active Directory that requires on-going maintenance and support. Not ideal as teams and business needs grow. Amazon Web Services, while offering incredible cloud computing capabilities, is not built to be a central user store, but rapid expansion of cloud infrastructure has outpaced smart, connected solutions. Until now. Directory-as-a-Service, or DaaS, is built for identity management across multiple networks, devices and locations, regardless of location. Directory service providers like JumpCloud offer a range of capabilities, from centralized user management and single sign-on support to virtual LDAP and multi-protocol, device-agnostic user access management. DaaS enables businesses to access all resources (workstations, cloud infrastructure, on-premise servers, and hardwired and SaaS-based cloud applications, as example) from one central port. As a cloud directory service, DaaS excels in being an end-to-end solution that integrates with complementary solutions, including Amazon Web Services. Directory-as-a-Service is the premiere choice for companies wanting one centralized solution that is location-independent and device-agnostic, working across Mac, Linux and Window machines, as well as WiFi networks, servers, and web-hosted applications businesses use these days to operate successfully. While both solutions are designed to provision and manage users with a few keystrokes, only one extends beyond the walls of Amazon and Microsoft: Directory-as-a-Service. In short, Daas is a robust management portal offering full-range Identity-as-a-Service. That is, a solution that effectively secures identities across a wide variety of services and solutions: Amazon AWS, RackSpace, Softlayer, Google Compute Engine, LDAP, SAML, RADIUS, as well as Windows, Linux, and Apple operating systems. As more companies move to the cloud and work with heterogeneous operating systems, they need a solution that’s built to alleviate issues like location-dependency or manual configurations that require on-going maintenance. They also need a solution that simplifies the modern enterprise cloud, alongside on-premise resources. A solution like Directory-as-a-Service simplifies the lives of IT admins and the people they serve, while strengthening the technology behind the organization. Ready to discuss how Directory-as-a-Service can support your organization? Drop us a note. Or try JumpCloud’s DaaS for free.